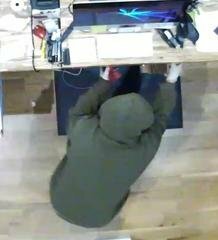 Suffolk County Crime Stoppers and detectives from the East Hampton Town Police Department are seeking the public’s help to identify and locate the person who burglarized multiple businesses last month. East Hampton, NY - December 4th 2014 - Suffolk County Crime Stoppers and detectives from the East Hampton Town Police Department are seeking the public’s help to identify and locate the person who burglarized multiple businesses last month. A man burglarized six businesses in East Hampton and Wainscott on November 29, 2014 between midnight and 1:10 a.m. The suspect smashed the glass door or window to each business, entered and stole cash. He fled in a white pickup truck with black bed-rail mounted tool boxes and a ladder rack. The truck had a large dent on the driver’s side rear quarter panel and apparent writing on the driver’s side door. The man fled in the truck west on Montauk Highway. The man is described as white or Hispanic. Subject: LongIsland.com - Your Name sent you Article details of "Suspect Wanted for Burglarizing Hamptons Businesses"